This banner was flying over one of the busiest intersections in Burbank, California, the day of the NFB of California's wine and cheese reception and silent auction. The event was also a highly successful effort to educate the public about the many programs of the National Federation of the Blind. This year's national convention attendees in Louisville well remember the introduction of Whozit, the dynamic symbol in our new logo. And just as many remember the announcement of our Meet-the-Blind Campaign, the first step in presenting that new logo to the public. The annual campaign is a coordinated, nationwide project planned and designed to provide occasions for Americans to meet blind people and learn firsthand about their livesfor example, the way they manage day-to-day tasks and the fact that blind people are like the sighted with the same joys and concerns. This October it also provided an excellent opportunity to introduce our new NFB logo to the public to help Whozit become a nationally known symbol, instantly identifiable as the representative of the Voice of the Nation's Blind. Many affiliates and chapters responded with great enthusiasm to the campaign and overwhelmingly participated in our first Meet-the-Blind Month this October. Over half of our state affiliates organized events, sponsoring more than fifty affiliate and chapter activities across the country. State affiliate presidents Nancy Burns, Anil Lewis, Sharon Maneki, Roland Payne, and Mark Riccobono were very helpful in providing details about their states' Meet-the-Blind-Month activities to the national office, which enabled us to publicize the many local events on the NFB's Web site. For the complete list of affiliate and chapter activities, go to <www.nfb.org> and the Meet-the-Blind Campaign link. 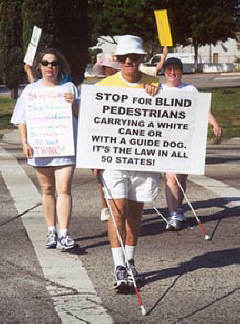 Using the Meet-the-Blind Campaign Guide, affiliate and chapter members organized walk-a-thons, picnics, and fundraisers and invited residents of their states to join them at state conventions. People were given handouts of our new, colorful NFB alphabet cards (proudly displaying our Whozit logo) and Meet-the-Blind fliers. They were also shown our Meet the Blind� In Our Voices video. 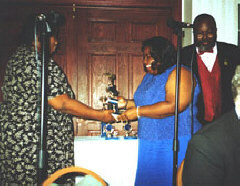 Shirley Barksdale, Treasurer of the Atlanta Metropolitan Chapter, presents the Member-of-the-Year-Award to Melissa Imtiaz at the chapter�s first annual Black Tie � White Cane Appreciation Banquet while second vice president Keith Tonge looks on. Of the known Meet-the-Blind-Month events, NFB's of California, Georgia, Maryland, West Virginia, and Wisconsin held more than twenty-six. Events ranged from state conventions (thirteen in all) to fundraisers, such as Atlanta's gospel sing, to West Virginia's NFB-NEWSLINE� conference and Wisconsin's walk-a-thons. But most groundbreaking of all was NFB of Florida's Meet-the-Blind-Month Web page listing various chapters' events. Affiliate president Wayne Davis and NFB of Florida Webmaster Dan Hicks provided this greatexample of the Web's potential for linking local affiliate and chapter Web sites with the national organization's Web site. For many chapters the traditional observance of White Cane Safety Day went on as planned with the incorporation of materials from the Meet-the-Blind Campaign, thereby maintaining a traditional NFB event while introducing Whozit to the public. 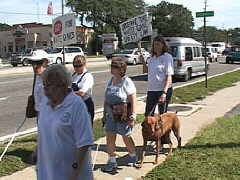 NFB of Florida Polk Chapter members Donna Kelly, Joe Dobbs, and April Stanley cross a busy intersection during the chapter�s White Cane Walk. The national headquarters in Baltimore, Maryland, launched its month-long series of activities with a noontime rally at Baltimore's Harbor Place, featuring local celebrity Gerry Sandusky, sports anchor for WBAL TV-11 Sports, and our own NFB member and blind mountain climber Erik Weihenmayer. Erik, who had just returned from his NFB-sponsored seventh summit expedition, provided a rock-climbing demonstration at the rally, as he and other NFB members scaled a thirty-foot climbing wall. Erik was also the keynote speaker at the Federation's 2002 CelebrationA Festival of Achievement. There you have a brief overview of what happened during the 2002 Meet-the-Blind Campaign. It is not too soon to begin discussions of what chapters and affiliates want to plan for next October, and don't forget to keep the national office informed about your decisions. NFB of Florida East Hillsborough Chapter member Tom Goldman, Sophia Brennar, Janice Butler, Susan Strasavich, and Merry Schoch join the chapter�s annual White Cane Safety Day walk. 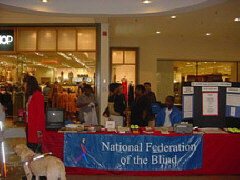 Members of the Atlanta Metropolitan Chapter of the NFB of Georgia staffed a series of information booths in malls and governmental buildings around Atlanta during Meet-the-Blind Month.